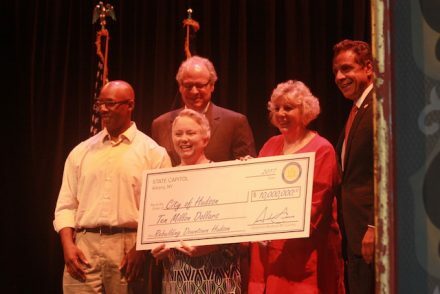 (HUDSON, N.Y., August 1, 2017) – The city of Hudson is one of 10 winners in a statewide competition for $10 million downtown revitalization grants, Gov. Andrew Cuomo told a packed house at Hudson Hall this afternoon. Cuomo credited the city’s own proven commitment to revitalization efforts as an essential qualification for being chosen from 104 applicants for the funds, part of the governor’s Downtown Revitalization Initiative. Cuomo said the grants are awarded to communities that already are growing, show promise, evidence of community investment, and enlightened government. Cuomo said Hudson “has almost everything,” denoting the city’s thriving antiques, arts, and culture sectors, as well as its waterfront. The crowd leapt to its feet and cheered when Cuomo ended his speech with the news that Hudson had been selected, having kept the audience in suspense the entire time. He threw a curveball when he noted that this year, the award field is being expanded to second, third, and fourth-place winners (whom, he joked, would be awarded $1 million “and a set of steak knives”). The rapt audience wasn’t sure where Cuomo was headed at that point – was he going to announce that Hudson wasn’t a first-place winner? But then he dropped the news that all were expecting and hoping for. “We made it, Hudson!” said Mayor Tiffany Martin Hamilton, accepting the award on behalf of the city. Hamilton spoke of the creation of a BRIDGE District, which she said stands for Build, Renew, Invest, Develop, Grow and Empower. “Beginning today, a door is wide open for so many opportunities,” said Hamilton, who thanked a long list of city and agency officials who helped put together the plan. 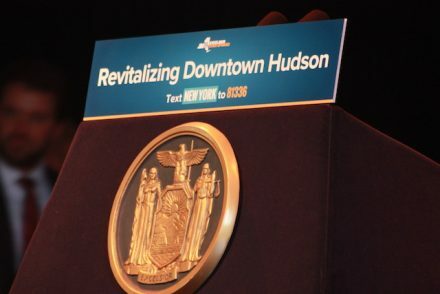 She also singled out Melissa Auf der Maur of Basilica Hudson and Chris Stapleton of DigiFab as two civic leaders who fought hard in the effort to bring the grant to Hudson. Now, the next chapter begins – figuring out who has control of the money, and who decides how to spend it. ← Will Gov. Cuomo Drop $10M on Hudson?